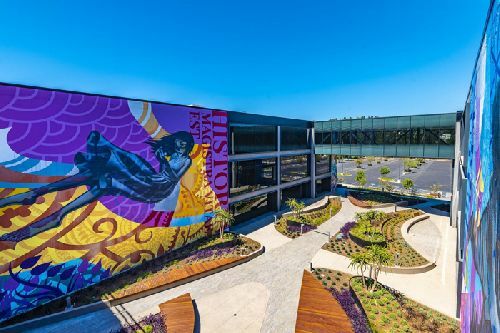 Construction is finished on AMP&RSAND, a 330k sf, Class A creative office center located on San Diego Union-Tribune’s former headquarters in the Mission Valley area of San Diego. The project, a development of Casey Brown Company, was built by C.W. Driver Companies. AMP&RSAND is located at 350 Camino de la Reina. It is within walking distance to the Fashion Valley Mall, the Hazard Center and the Fashion Valley Trolley Station and Transit Center, in addition to popular dining, retail and entertainment options. The redevelopment of the 13-acre campus included a major overhaul of a five-story office tower and a three-story industrial/office building. Each consists of 165k sf, creating a modern and highly amenitized office complex. The re-imagined spaces incorporate the outdoors with parks throughout the property and along the adjacent San Diego River. The three-story building originally held the Union-Tribune’s printing plant and was built to withstand the heavy load of printing presses and other equipment. Faced with all brick exterior and concrete interior elements, C.W. Driver Companies was tasked with cutting through the thick composition to open interiors to more natural light, adding new large glass windows and doors. Designed by Wolcott Architecture, the AMP&RSAND redevelopment project brings the two dated buildings, originally designed and constructed in 1973, into the new era by incorporating modern design elements that pay homage to the property’s unique past. Thirteen-foot ceilings and new oversized windows bring in natural light, while the interior design creates an industrial loft-style feel with exposed brick, concrete pillars and polished concrete floors. The creative work space also incorporates the surrounding landscape to encourage working outdoors. The property now features nine patios and 64k sf of outdoor collaborative space, in addition to an amphitheater for multi-function gatherings. A massive ficus tree planted by a former owner of the Union-Tribune, Helen Copley, was preserved in the redesign process and now serves as a prominently featured central meeting space. Called the Treehouse, the unique space includes hanging chairs, hammocks and creative meeting areas. Other on-site amenities include a craft coffee café, indoor/outdoor fitness studio with spa-like lockers and showers for tenants, concierge services such as valet parking and a bike center that offers repair services and ride-sharing bikes. Casey Brown Company acquired the Union-Tribune property in 2015 for $52 mil from Doug Manchester, the former publisher of the newspaper. The property is named for the ampersand character, which is the last figure in the typesetter’s alphabet and the last character printed when the Union-Tribune shut down its presses in 2016.